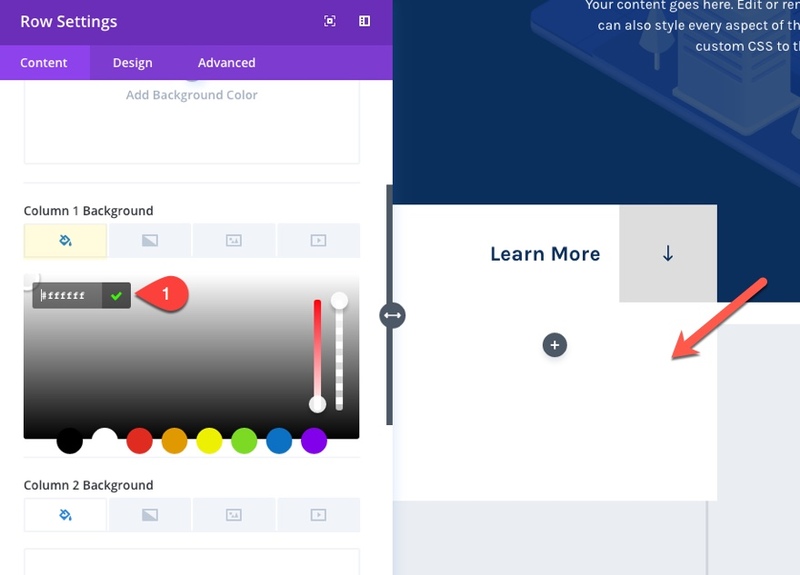 Creating a custom scroll button on your fullscreen header is a great design boost to improve user experience, allowing the user to scroll to the next section of your page without having to scroll. Adding some eye-catching animation to your button may also improve your conversions. Divi already has a built-in scroll button to make things really easy for you to add this feature on fullwidth headers. But today I thought I would show you how to use the button module to accomplish the same functionality with some modern design features. 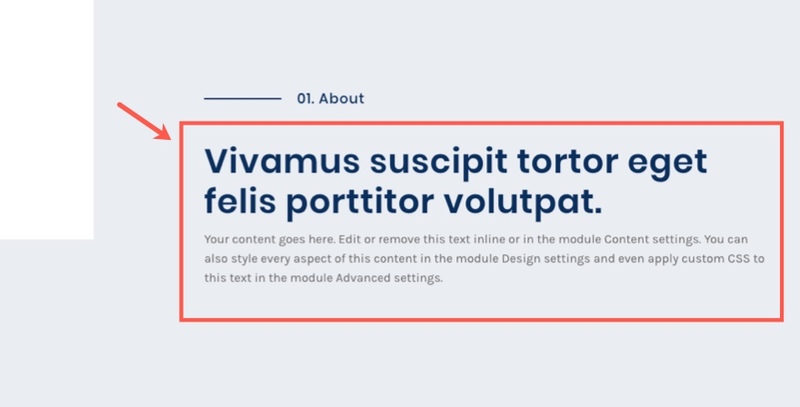 In this tutorial, I’m going to show you how to turn a button module into a custom scroll button that pops up at the bottom of the screen when you load the page. I’ll also be throwing in a few design tips along the way for inspiration. Here is a peek at the design we will be building together. 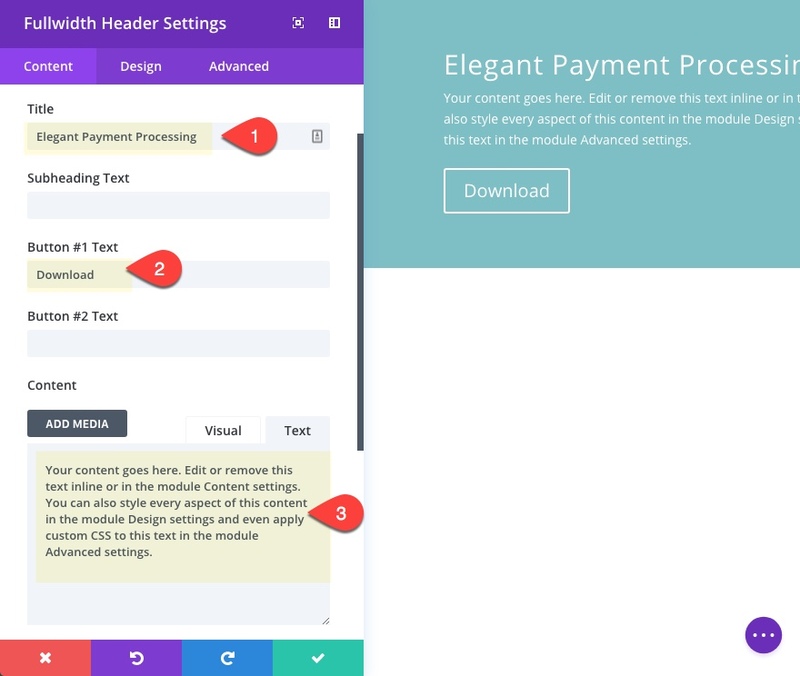 Check out how the learn more CTA pops up when loading the page and scrolls to the next section when clicked. 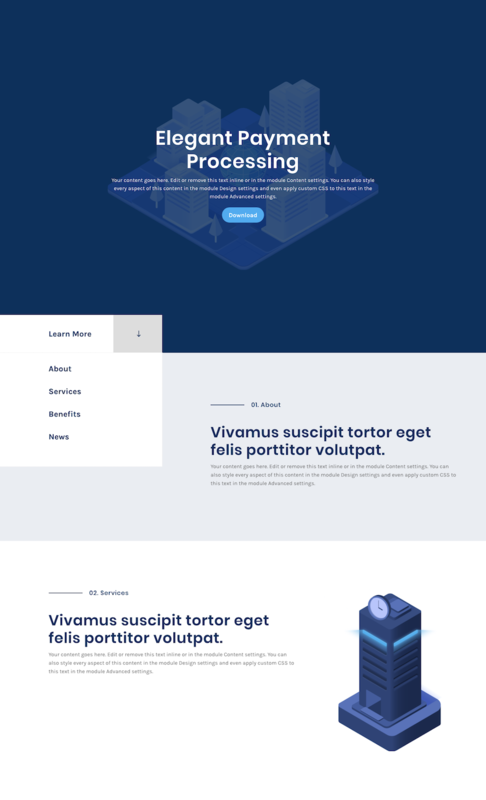 For this tutorial, all you need is Divi. 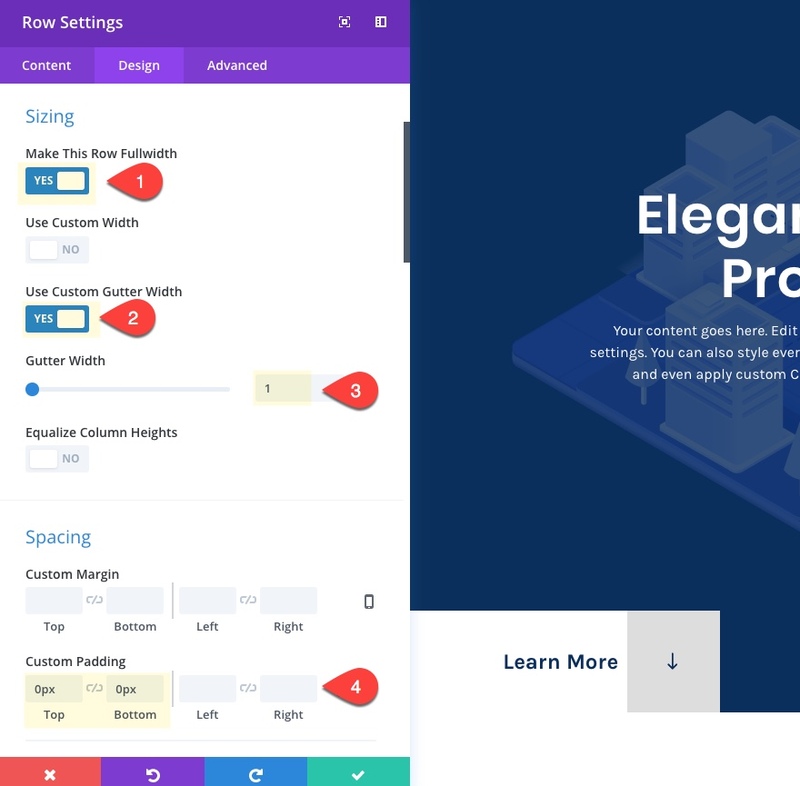 I’ll be using an image from one of the layout packs, some design magic with the visual builder, and a few custom css snippets to add a final touch to our scroll button. 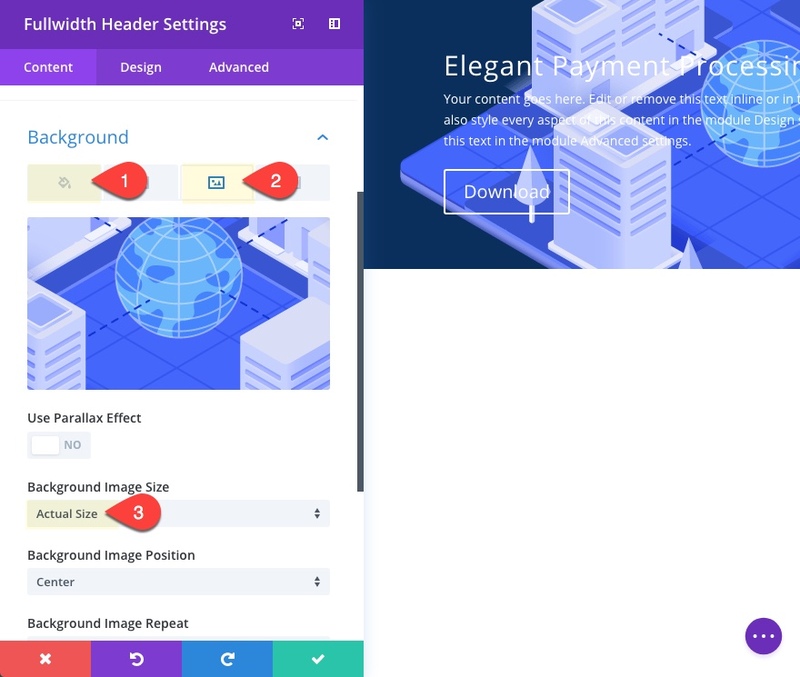 To design the fullscreen header, create a new page and deploy the visual builder. Then add a fullwidth section with a fullwidth header module. 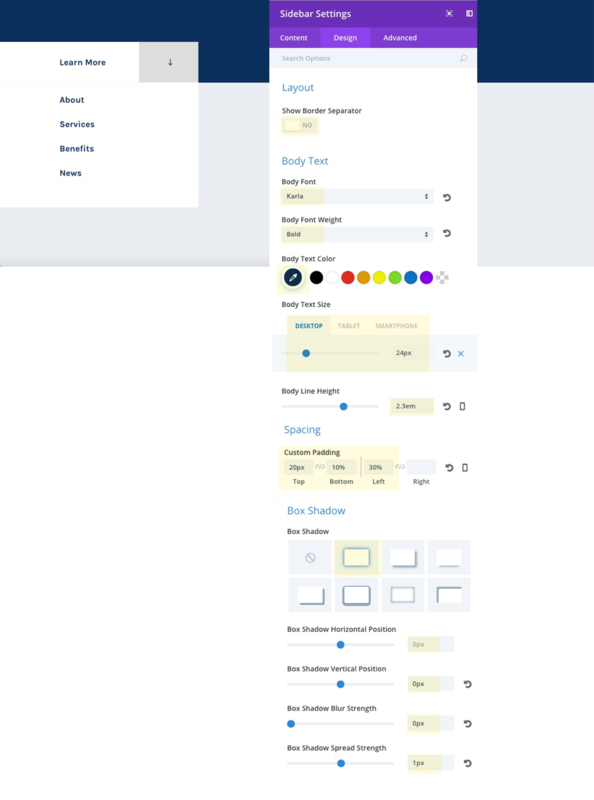 Under the design tab, change the layout to centered orientation and select to make it full screen. Give your header an overlay color so that you can read your text easier. That will do it for our fullwidth header. Now for the fun stuff! For this scroll button, I want it to sit flush on the left side of the page. So add a three column row to your section. Then add a button module to the left column. The #two URL will serve as an anchor link to the top of the next section which will include the matching CSS ID “two”. This is the basic functionality of creating a custom scroll button. This allows the button to span the full width of the column. This positions the arrow icon to the right of the button. 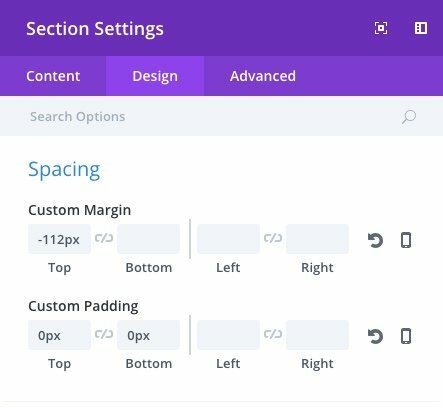 Now we need to customize the section settings to bring the button up over the fullwidth section above and get the spacing right. Now we need to adjust the row spacing as well. Update the following row settings. Now check out the live page. You will see a button popup on the bottom left of your fullscreen header when the page loads. Now that we have our button ready to scroll, let’s add another section to create a unique scroll-to section. Create a regular section with a one-third two-thirds column structure. This column structure is key because it will allow us to create a left column the same size as the one directly above it with our button. 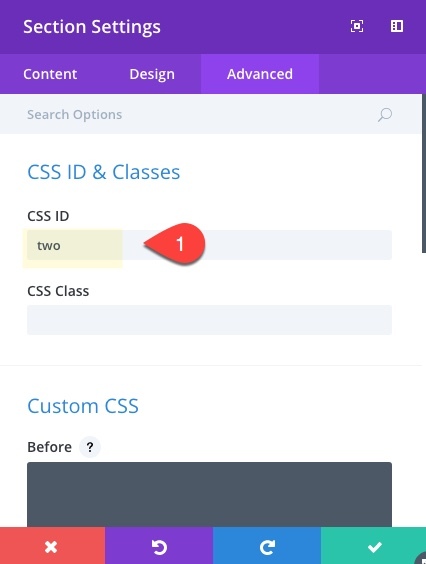 In the Advanced tab, add the Custom CSS ID “two”. This will allow you button to scroll to the top of this section. To speed things up, copy the row style of the row containing the button in the above section. Then paste the row style for your new row. In the content tab, update column 1 background color to #ffffff. This will serve as the background of your menu box under your button. Now we are ready to add our sidebar module to our left column. But before we do that, you need to create a custom menu. Select Pages, posts, etc. that you want to include in your menu. Or create custom links. 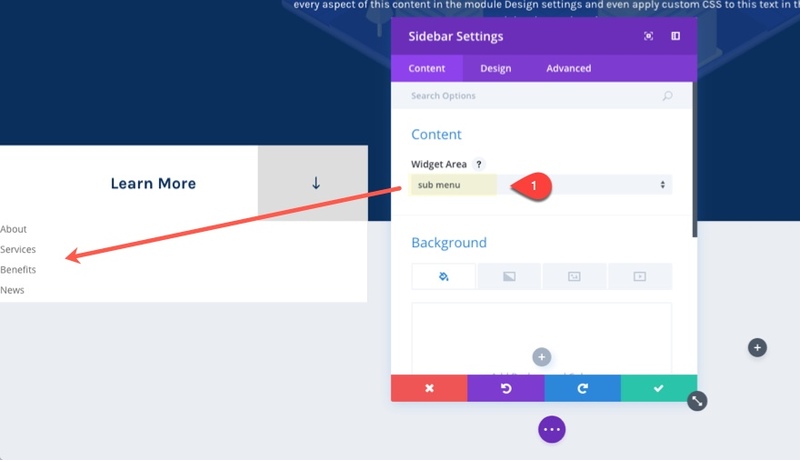 Follow these steps to create a navigation menu widget so that we can add it to our page via the visual builder. Drag the Navigation Menu Widget into the new widget area you created. Toggle open the widget settings and select the menu you just created. 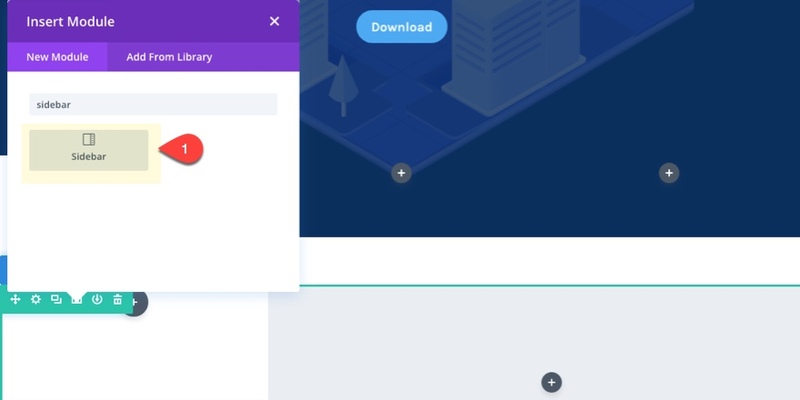 Now we can go back to our page and deploy the visual builder. 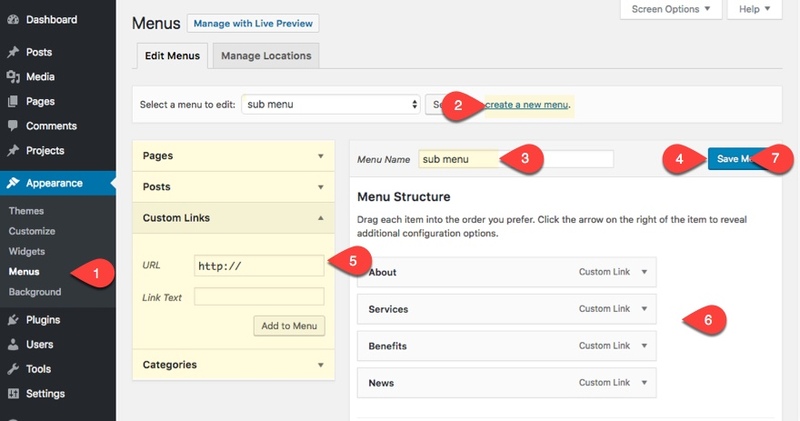 In the left column of our bottom section, add a sidebar module. 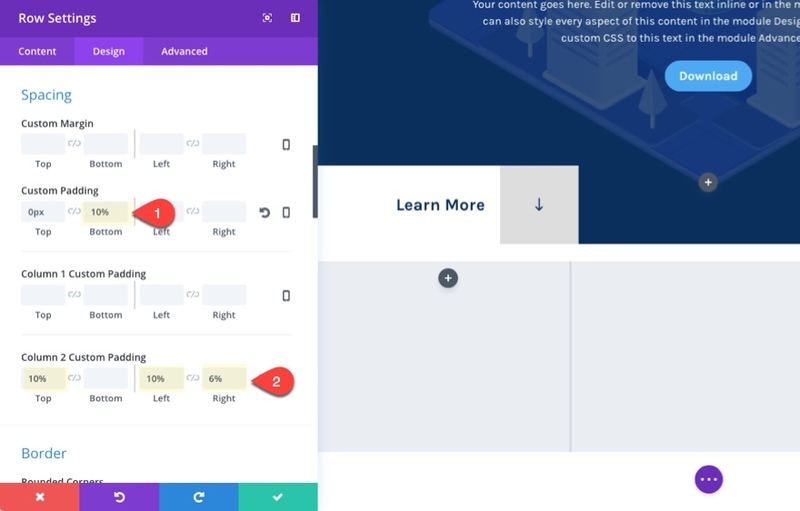 The 30% left padding is helpful to line up with the button text above which also has a left padding of 30%. 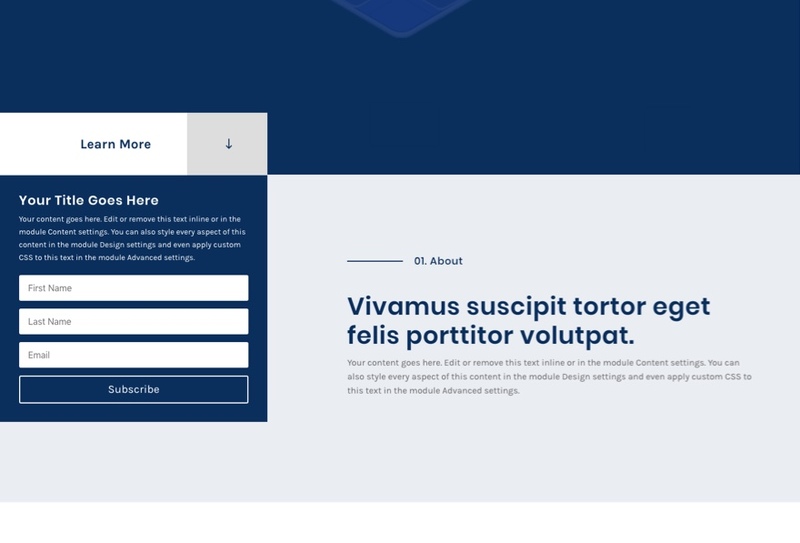 This is a creative way to add a border outside of our box and add a slight separation between the scroll button and the menu box. 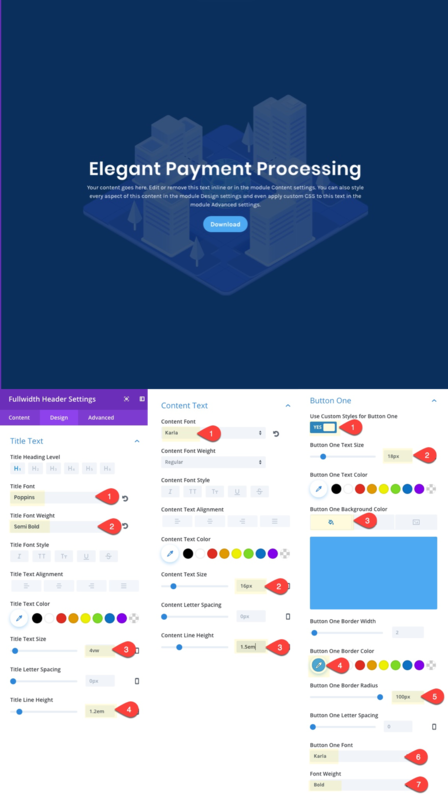 In the right two-thirds column of the section, we are going to add a some content to give you an idea of how you use this layout for your own website. Tip: In order to get the divider to be on the left and vertically centered of the header, match the divider height (18px) with the px value of your header text (18px). Then use custom margin to bring move the header up the same number of pixels (minus one to account for the width of the divider line) using the negative pixel value (-17px). After that, give your header enough left padding to account for the 100px length of the divider line (120px). Change row column to two-thirds one-third structure. Under row settings, change the custom top padding to 10%. Restore Column 2 Custom Padding to default. Delete the sidebar module in the left column. Move all modules in the right column over to the left column and update the content. Then add an image in the right column. To change your button location, simply drag it to one of the three columns in the row. Simple as that! 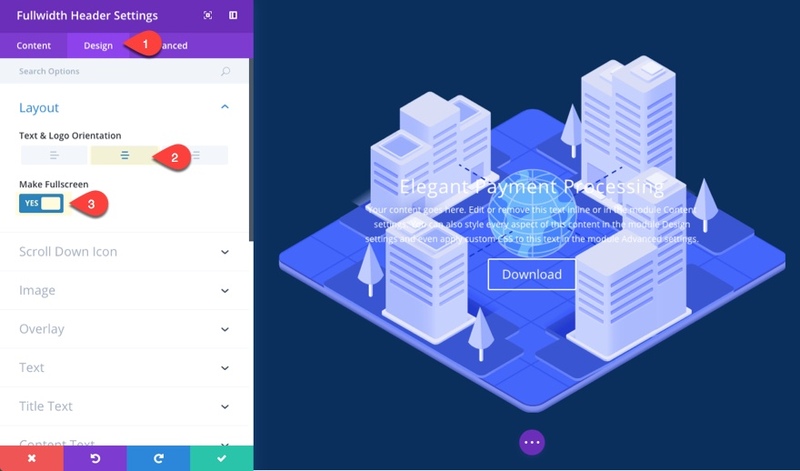 This custom scroll button with the menu box should definitely get you thinking about all of the different applications. For starters, you can supplement the menu in the box under the scroll button with anything! This would be a great place for a contact form, email optin, or another call to action of some kind. This layout scales pretty well on mobile. The scroll button will simply scale the full width of the screen on tablet and smartphone. I really enjoyed building this layout and exploring the possibilities it brings to the table. The custom scroll button alone is great way to make your fullscreen sections more prominent. 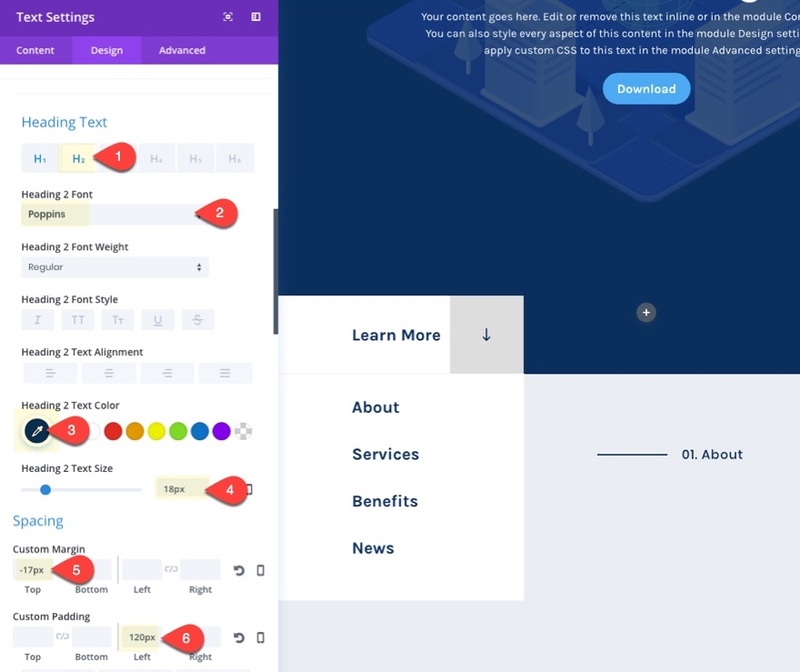 I hope this design will help inspire you to create even more unique buttons and CTA’s for your own website. Great work! This is beautiful. Thanks that’s a neat appraoch. Great tutorial – as usual. 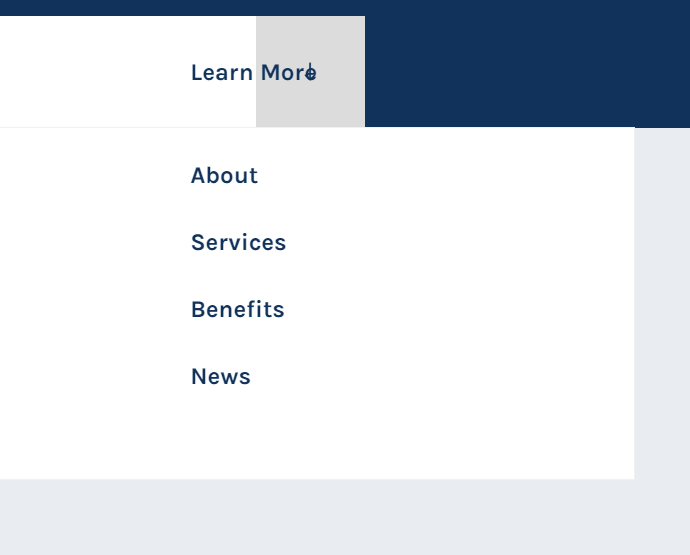 But one question: how can I make a scroll down button that can be used on modules other than the full width header? Great tutorial, as usual. But one question: How can I make a scroll down button that can be used on other modules? Good work Jason! A creative use of Divi to get my imagination going! Am I the only one ending up with a button like this? Under button settings advanced tab, replace “display:block” with “display:block !important”. Sorry about that. I’ll update the post. Are you sure you’re suppose to add the following css to the After input box: “position: absolute; right: 12%;” in the button setting? Seems like the arrow gets squished into the “Learn More” text. I just love this. Thanks Mr C! Quick question: is there a way that you know to make this leap from section to section so that it is linked to the viewers “scroll” behavior and not to a button? There is a button to download the images at the bottom of the article. Or you can import one of the layouts from the Divi Library and the images will be added to your media library. There is no link to see it in action? Same here. A demo page would really help! Why did you choose a responsive unit (vw) for title text size, and a non-responsive unit (px) for the body? What is the reasoning behind using vw for the title size, instead of em or %? Using vw for titles accomplishes two main things: 1) It scales the font size to the browser width so when viewing the title on large screen sizes, the title is more proportional. 2) Because it scales with browser width, the line length remains consistent as well so you don’t have to deal with line breaks when resizing your browser window. The trick is to make sure you override this vw value with a px value on mobile so that the text doesn’t scale to a size that is too small. In short, it is a way to keep the design of your header text looking the same on varying desktop browser widths. I usually avoid using vw on body font because readers usually expect a consistent size for better readability. Is there a library download for this? Hello and thank you! Very nice inspirational for a site I have under construction. This site has multiple menu items. Your design is for front page. I wonder if you have suggestions for matching “page 2” designs? I need two pages presenting 3-4 product options and call for action; “fill in form and click send”. Also, we will have a blog page. I love this layout and am using it for a new project. However, I can’t seem to get the menu to ‘stick’ underneath the ‘Learn More’ button. It works for a while, but then mysteriously moves to the middle of the page. I’m not sure. What causes it to move out of place? Could it be that you possibly duplicated the section with the button and then carried over the negative top margin? You may have two sections overlapping.